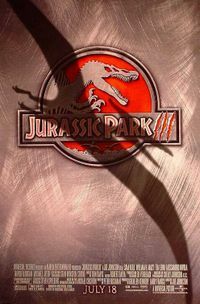 Jurassic Park III is a 2001 motion picture, and a satiric sequel of The Lost World: Jurassic Park and the highly successful original Jurassic Park. The film was directed by Joe Johnston and stars Sam Neill, T�a Leoni and William H. Macy. It is some four years after the second film, The Lost World. The public is aware of the existence of cloned dinosaurs on Isla Sorna. Taking advantage of this, an illegal boat-towed para-foiling operation "Dino-Soar" has been set up to give coastal tours of the island. A young boy, dinosaur enthusiast Erik Kirby (Trevor Morgan), and family friend Ben Hildebrand (Mark Harelik), decide to go parasailing. However, the boat is seemingly attacked by dinosaurs and left unmanned, heading toward some rocks. Erik and Ben then detach the tow rope and drift towards the island. Meanwhile, the viewers revisit Alan Grant (Sam Neill) and Ellie Sattler (Laura Dern). Both have continued their paleontological careers but are working independently now; Ellie has married and has children; Grant is still digging, now with his young prot�g� Billy Brennan (Alessandro Nivola), and has made some interesting discoveries about the Velociraptor, even producing a replica of the animal's resonating chamber, equivalent to a voice box. Grant is approached by Paul (William H. Macy) and Amanda Kirby (T�a Leoni), saying they are wealthy thrill-seekers, who want Grant to give them an aerial tour of Isla Sorna. Grant is reluctant at first but once again, the Kirbys' promise of funding his dig gets the better of him. The plane carrying Grant, Billy, the Kirbys and three mercenaries arrives at Isla Sorna. Piloting the plane is M. B. Nash and a self-styled "booking agent" named Michael Udesky. Grant suspects something is not quite right when the Kirbys try to land the plane. Grant becomes agitated and is knocked unconscious by the last mercenary named Cooper. When the plane lands, it is quickly attacked by a Spinosaurus, a colossal finned dinosaur, killing Cooper on the runway. The plane hits the Spinosaurus on takeoff and crashes up in some tall trees. The dinosaur bites the front of the plane off and eats the pilot, Nash (along with a satellite phone), stranding the rest of the group on the island. A chase ensues in which the party runs into a bull Tyrannosaurus which chases them until it meets the Spinosaurus. A fight ensues where the Spinosaurus kills the Tyrannosaurus by snapping its neck. Grant finds out that the Kirbys are in fact searching for their lost son and not as wealthy as they claim. Grant decides to lead the group toward the shore. Along the way, the group encounters the parafoils, as well as the remains of Ben Hildebrand. Erik, however, seems to have escaped safely. Billy salvages the parafoils. Also discovered nearby are a nest of Velociraptor eggs. The group approaches an old InGen laboratory. After briefly exploring the building's interior, they are attacked by a group of Velociraptors. During the resulting chase, Grant becomes separated from Billy and the Kirbys. The booking agent, Udesky, runs into a pack of Velociraptors, who cripple him severely. Billy and the Kirbys have climbed up a tree and notice the man's body. He moves his arm leading them to believe he is still alive. When Amanda Kirby nearly tumbles from the tree, two raptors scurry out of the bushes and attack. One of the male raptors calls for help and the two threatening Billy and the Kirbys are urged to go. Before leaving though the male raptor snaps Udesky's neck. In the meantime Grant is rescued from a pack of raptors by young Erik Kirby, who has been living on the island for two months in the back of a truck. Erik has salvaged supplies and food from the InGen compound and has discovered other tools for survival. Eventually, everyone is reunited, but they soon find themselves being chased by the Spinosaurus (who they notice after they hear the satellite phone ringing from inside the dinosaur). Able to find shelter in another building, Grant finds out that Billy stole some Velociraptor eggs, explaining the earlier attack. He is furious with Billy, claiming he is "no better than the people who built this place". The group attempts to reach a boat docked in a nearby river. However, they have to pass through a massive aviary and are attacked by Pteranodons. Using the parafoil he salvaged, Billy tries to rescue Erik from a nest of Pteranodon "chicks" and is attacked by several adults. He plunges into the river as they continue to attack him, seemingly killing him. Grant and the Kirbys board the boat, encountering some Parasaurolophus, Brachiosaurus, Stegosaurus, and Ankylosaurus grazing in a field. Grant briefly marvels at the way they coexist with their environment. While floating down river they hear a familiar ring tone. They find some Spinosaurus dung containing the undigested bones and clothes of the mercenaries. Among them is the satellite phone, swallowed by the Spinosaurus earlier. A Ceratosaurus approaches but is warded off by the smell. As they set off down the river, Erik notes that the fish in the water seemed frightened. The Spinosaurus attacks and rips the engine open, spilling oil into the river. Grant attempts to contact Ellie, but only gets out "The river... Site B! The river!" as the Spinosaurus attacks again, tearing the boat apart. It gives Amanda a minor scratch injury with its huge claws and nearly drowns the group. Paul manages to distract the Spinosaurus by climbing a construction crane while Grant fires a flare gun, igniting the spilt engine oil and scaring the dinosaur away. The group is close to the shore when suddenly the raptors reappear, wanting their eggs back. The eggs are given back to the raptors, and using Billy's raptor resonating chamber Grant fakes a signal that momentarily confuses the raptors, who retreat when they hear the approach of helicopters. The group arrives at the beach to see a military detachment, including two aircraft carriers, no doubt sent by Ellie, awaiting them. As they board a helicopter, Grant finds Billy, still alive but badly injured. As the helicopter heads toward an amphibious assault ship, some Pteranodon fly by, looking for new nesting grounds.